Kostroma is one of the most important cities in the Golden Ring of Russia, a collection of ancient towns that have preserved their unique architecture, culture and history over time. Kostroma was founded in 1152 by Suzdal prince Yury Dolgoruky during his military campaign in the land of Kazan Bulgars. The city's early history was brutal. Kostroma was invaded by the Mongol Tatars, was devastated during the wars between Moscow and the Tver principalities, and was burned down several times in the 15th century. Things started to look up in the 17th century. The city became a major center for artisans and one of the richest merchant lands in Russia. The local icon painters, tanners, blacksmiths, builders, and other master craftsmen were of great renown throughout Russia. By car: Take highway M8 from Moscow to Yaroslavl and from there follow A113 to Kostroma. Approximate travel time is 4 hours. It's important to leave Moscow at the right time to avoid the usual summertime traffic jams. By train: Night trains depart daily from Yaroslavsky Station. Tickets for coupe seats cost about 2000 rubles ($60) one-way. 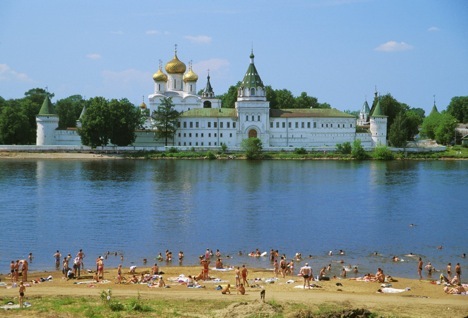 Today, Kostroma is a small provincial town on the Volga River with a population of about 275,000 people. However, Kostroma is actively developing. In recent years, the city has worked to promote tourism. The squares have been improved and landscaped, monuments have been restored, new hotels, cafes and restaurants have opened, and all kinds of excursions are now offered that are designed to show visitors around the city. Over the past few years more and more visitors come to Kostroma. Some enthusiasts make day trips here from Moscow, although Kostroma is the farthest Golden Ring city from the capital. It's worth the long trip—this stunningly beautiful city is primarily known for its architecture and folk heritage. When you arrive at Susanin Square, the city's centre, you might think you are in St. Petersburg. Guests may be surprised to find purely classical architecture from the 18th century; most cities in the Golden Ring are filled with old Russian-style wooden buildings. In this uniquely shaped square you can find the former guardhouse that used to house military regiments, General Borshchov's house where Nikolai I stayed when visiting his son Alexander II, and a shopping centre that was built after a fire in 1773 and is reminiscent of Italian architecture with its numerous arcades. The most interesting building on the square is the fire lookout tower, built between 1824 and 1827 at the behest of the governor. The lookout tower seems somewhat out-of-place, looming over the square with its strict facade and columns. The building also seemed unusual at the time of its construction. Legend goes that after his visit to Kostroma, Emperor Nicholas I spoke admiringly about the building, which was well known as the best fire station in the Russian provinces. The main tourist and Orthodox attraction is the Holy Trinity Ipatiev Monastery, an example of ancient Russian architecture. According to tradition, the cloister, which is still an active monastery, was founded at the beginning of the 14th century by a Tatar mirza (nobleman) named Chet after his illness was cured. However, scholars believe that the monastery existed here earlier, possibly since the middle of the 13th century. The five gilded cupolas of the stunning Church of the Trinity Cathedral are tucked away behind a high white stone wall. Mikhail Romanov decreed that a new town be built along the western wall of the monastery. It was surrounded by high walls that have two gates and three towers - two corner ones and one in the middle over a gate. The middle tower is also known as the Green Tower for the color of its octagonal stone hipped tile roof. The tower was constructed in the place where the procession stopped that was accompanying Mikhail Romanov on March 19, 1613 as he made his way to Moscow after being elected as ruler. It is here that one of the main Orthodox relics is housed, the miraculous Ipatiev icon of the Mother of God, which thousands of pilgrims from all over Russia come to gaze upon each year. Kostroma is especially beautiful in the evening. After strolling through the squares and seeing the sights, be sure to take a boat ride. The crimson sunset that comes into view while you float along the Volga is lovely, and the city at night is beautiful to drift by.